Thank you for joining us on our 42nd episode in our podcast series that’s about investing in tax-delinquent real estate specifically, but we also cover other REI strategies as well. In our business, we focus on properties where the owners have not paid the property taxes. As a husband and wife investing team, we’ve done nearly 3,500 deals – in land and houses – with little competition and big profits. And we’re letting you in on how to do it all. 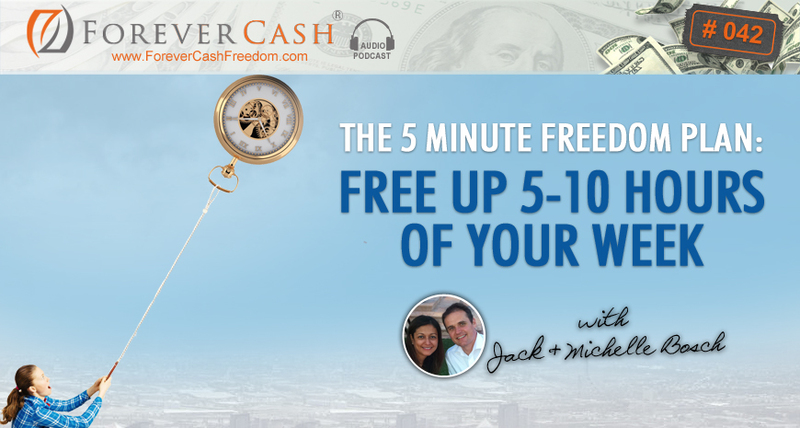 Today’s episode is about a thinking tool that we created called the 5-Minute Freedom Plan. It’s an exercise that we’ll walk you through step-by-step that helps you free up some time so your business or operation can grow. By doing this exercise, you’ll figure out the things that you are gonna have to say ‘no’ to or stop doing, so that you can say ‘yes’ to your goals that will help you grow and reach freedom. Get a pad and paper ready for this 5-minute game changing tool. Michelle: Hello everyone. This is Michelle Bosch. Jack: And Jack Bosch. And welcome to the Forever Cash Real Estate Investing Podcast. I am very excited or we are very excited to have you here. And the first podcast of 2016. Michelle: Oh, my God, it’s already 2016. Jack: It’s already 2016, very exciting. Michelle, as always, what are we going to talk about today? Michelle: Well, what I want to talk about since we are starting 2016 and we all probably have already started with our New Year’s resolutions and doing some goal setting for what 2016 will be, I want to basically go through what we call the five-minute freedom plan which is basically an exercise, a small exercise or a small tool for you to prepare for all of those 2016 goals. Before you even go after those goals, there will be things that you will need to stop doing. So and this small exercise will basically help you figure out what are the things that you are going to have to say no or stop doing so that you can say yes to those goals and you probably have already committed on your vision board or whatever it is or whatever process it is that you follow. Jack: Right, and in that case, it obviously works too. And you can also take the principles we talk about, then perhaps translate it into your personal life if you are like stressed then, and in your personal life you are doing a thousand different things and you are over-committing and you are constantly stressed. You can apply the same kind of exercise too but in its pure form we designed a five minute freedom plan for our business mastermind of peer advisory of seven-figure plus business owners called the UltimateBoardRoom.com or UltimateBoardRoom.com and we are going to adjust a little bit for even the solopreneur right now. Before I say that, as always, I want to make sure that you know that the meeting notes or the podcast notes are on ForeverCash.com/Podcast. Also, you can get access to several free thank you courses and a seven day trial of things under ForeverCashClub.com. You can go there or ForeverCash.com/Freedom and all these links are listed on the podcast notes so if you don’t have time right now to write it down, don’t write while you are driving. Just make sure that you go to ForeverCash.com/Podcast later on and download the transcript, download some of the Twitter blogs and go to the links that are listed there. Right, so let’s get started. Michelle: Okay, so then let’s get going with this five-minute freedom planning and so we are going to explain a little bit how what this is and how you are going to go about completing the exercise that in all reality it should take you about five minutes. So no matter what business you are in or if you are a solopreneur, we probably know you. You are already making money, you already have success, you are what they call an entrepreneur and people admire you, you might even drive a fancy car, you live in a nice house, you have made it from the looks, from the outside in, you have it done. Michelle: Of just one or two and you work full-time. Jack: …Or just one or two, you work full-time and so on and so forth because there is still stuff that doesn’t get on… stuff that constant fires that need to be put out. Michelle: Or you are constantly falling behind. Jack: And you are constantly falling behind so it really translates into your personal life, into your business life as a solopreneur as well into a bigger environment that was designed for when you have a staff around you and you are still stretched and still constantly pulling out fires. Michelle: But this is more than what will be going through your head. What I described earlier, what will be going through your head and the feeling of overwhelming that you are going to be having and that is because everyone of us thinks that our lives are different, specific, unique that our businesses are whatever investing businesses we are on is unique. But at the end of the day, our problems are not necessarily special. If we are talking about business, business is business is business is business… and they will be the same, the same fundamental, things will go wrong regardless that it is understood that you are young. Jack: But Michelle, you don’t understand, my business is different. Jack: Brake and motor manufacturing company. Michelle: …Brake and motor. Yeah, anything. No matter what business you are in, all of these businesses are going to need more leads, more clients or more buyers, more revenue and more profits. Michelle: Here, you will have pieces of land or homes that you are trying to flip. Jack: Right, exactly, and the keys is that whether or not you are aware of it, manage with the leadership tools exist that actually help you coordinate all these moving pieces but if you don’t use them, if you don’t know they are there and if you don’t have them, then understandably that leads to frustration and you are working longer hours and ever and ever longer and dealing with more stuff like people issues and Michelle just mentioned and sales or stuff falling through the cracks, processes, procedures, customers, vendors and so on and the larger your business is, the more of these stuff of these things happen. Right. There is no difference no matter what business you are. Michelle: Yeah, because if you have chaos right now, if you only grow and basically in leads and prospects and clients and revenue and if there is nothing fundamentally that changes to sustain the growth, basically that chaos will only be bigger. Jack: Exactly, we go from small chaos to big chaos and we don’t want that right and that’s why we put this together because this is a small tool but it is really useful to help you get your kind of like your head out of above water and just see like, “Oh, that is why this is happening,” so therefore the great news here is that there is a better way and we want to talk about that right now. Michelle: The exercise and we will basically walk you step-by-step but basically would you be able to identify all the following, you are going to be able to identify where you are spending your time, where you should be spending your time and what changes you have to make immediately in order to create more freedom while getting more done in your company and in your private life yeah. Michelle: So take a piece of paper right now and a pencil or a pen and I want you to basically have your 8½ x 11 sheet in front of you and I want you to basically divide the piece of paper from top to bottom into four sections and that means you going to have to write you know four columns and you are going to have to do three lines in a one line to three lines you know across so that you can have four columns in total and so once you have that I want you to go column A and I want you to write under column A, I want you to have different rows so the first row will be sales, the second row will be marketing, the third row will be advertising, the fourth row will be production. Jack: Basically put down all the different departments that you can come up with that exist in your business, if you don’t do production then production is not necessary. Jack: …Which is kind of the production part of your business in that case. Michelle: And if you are doing rehabs is it the management of the crew or you or you actually doing the rehab so you need to specify. And so once you have that under column A, what we want you to do is on column B and you want to go across each of these areas that we just mentioned for your business, we want you to go ahead and on a scale from 0 to 10, basically rate yourself as to how much are you personally involved in each of these areas so 0 being your never involved and 10 meaning you are always involved. Jack: Always meaning like literally on a daily basis or whenever that part is being done, you are involved in it, right, so that’s 10. So anytime there is a rehab to do, you are doing it, that would be a 10. If you don’t touch the rehabs at all you don’t even see the houses and you just get a report about them, then it would be a 0. If you are identifying new markets and you are the one doing that, you want to definitely do a 10, if somebody else or your partner is doing that or you are sharing that, maybe that is a 5 you know. Michelle: And for us real estate investors you know the marketing is not just the marketing when you are selling, but marketing when you are trying to acquire new properties as well. Jack: Right, exactly. Financial reporting, accounting, I mean I already mentioned accounting I believe so all these different things, put them down there and then put the number next to it, all right. So once you have done that, look at those numbers, chances are that if you like 90% of all entrepreneurs, you probably have a number of above 5 in more areas than you know you should be really active in right. Above 5 really means that you are on and ongoing bases involved in that perhaps not all the time, but that you are actively involved in it. Below 5 means that you are kind of like only occasionally involved in it and obviously on the fringes 0-1 means that you are not involved in it at all, you might just get a report and a 10 means you are basically doing it right. So look at that and if you are like as I said let me repeat it, if you are like 90% or more of entrepreneurs you probably have a high number in more areas than you know you should be active in. So chances are usually that is like at least in 4-5 areas you got that high number in it. Now if that’s the case for you or you are still wondering why you are stressed out right because there is nobody in this world who can run effectively a large business or let me ask you are you still wondering why you are not growing because there is nobody in this world that can run affectively a larger business say high 6 or 7 or even 8 figure business while being in charge of that many areas of their business. Michelle: But on a monthly basis if that is a positive number you can have a drink and if that is a negative you are going to have two drinks. Jack: You are going to have two drinks exactly, but the thing is you should look at your financials at least once a month, many entrepreneurs I know that have their company under control they actually look at their numbers once a day, now obviously I understand you might not get to, fill out column number C then look at it again and my understanding is that there will be a gap in there, let’s leave it at that point in a moment, so there will be a gap. You might have a 0 and you realize, “Oh man, I really need to be a little bit more involved in that,” and you might have a 10 there and you realize that should be a 2 right and you might have some 6s that should be 5s and so on and so forth so go through that and put that together and then look at it, now compare and chances are that there is quite a few areas where you should be less involved and there is probably only one or two where you should be more involved but chances are there are several areas we should be less involved. Michelle: Especially because at the end of the day there is maybe one or two things at most that we all excel and that we all basically have a superior ability yeah and you have passion for, there is maybe one or two things and everything else really they are not part of what we call you genius on and you shouldn’t be in that area anyways because it doesn’t energize you, it doesn’t bring your business forward and it is definitely not going to help you accomplish the goals that you have for 2016 and we hope that you have big reachable goals for this year. Jack: Right, so when looking at that you identify exactly that gap and where you are little or lot involved in areas or where you want to be less involved and these are typically exactly as Michelle the areas where you actually don’t even add much value, I am fully aware that there is parts of our company where I add negative value. Michelle: Yeah, absolutely. You screw things up. Jack: Thank you very much. I am glad I said that first and you just confirmed it, but yes there are areas in our business that I know I screw up to say that in Michelle’s words and so I want to stay out of these areas as much as I can yet get reports about what is going on right, so I know, you probably have the same thing. Then there are also areas like Michelle said that you don’t might probably not enjoy working in even if you are good at them because when you don’t enjoy something you still got to do it, even if you are good at it, chances are you perceive it as stress. Michelle: Yeah. It definitely doesn’t energize you. Michelle: And another thing that I want to mention is you probably also recognize when you go through this and you compare column B to C is that maybe what is happening is that there is absolutely 0 process that you have no procedure, no process and that maybe one of the reasons why things are constantly falling through the crack basically there is no good flow and you have not identified you know what happens for example if you are flipping a property one needs to have happen from A to B on the front part of that transaction and from you know C to F on the selling side of that transaction and so on and so forth. So sometimes it is an issue of process and that’s what makes you be super, super involved because you are the process. Jack: Right, and you might already also see the last one here, you might already also see that the reason why or the solution is no matter whether you start seeing those gaps and see like, well, the reason why there is a gap, why you have to spend so much time in that area is because you have nobody in charge that you can actually give that stuff too. Michelle: Yeah, nobody that you can pass the baton on and that basically will follow through on the things that you may be amazing and initiating yeah, or monitoring or you know managing but there is nobody else to help you basically finish that relay race. Jack: Exactly right. So but looking at it from a 10,000-foot level, what I want to say is that if you want to have a large business and at the same time still have some freedom in your life, freedom of time, freedom of purpose, freedom of being able to whatever you want to do then your goal should be to be close to 0 or to at least have a very low number in the majority of these areas and ultimately if your goal is to have a business that is really truly doesn’t need you then effectively your goal will be to be ultimately at the 0 in all of these areas completely and that’s the other part. So then the third step you want to talk about is now you want to… based on what you are seeing right now, based on where you are, where you want to be, you want to now go to column D and column D is you want to list for each of these areas, just one action step, particularly not for each of these 10 or 12 areas, for each of the areas that you know, you need to move where there is a big gap, the bigger the gap the higher the urgency of doing something about it. So if you have a 9 somewhere and you really would like to be the 4 that’s a big gap right, so you want to jump into that and literally go and come up with one or two action steps to get to the goal number. Michelle: Basically and those action steps will go along the lines of who of who needs to take care of it or who can I delegate this to, who can I hire, or it could be also a question of like, “Is this even needed to… Is it bringing really the profitability that I need it to bring or is it just a distraction or another shiny penny?” Yeah, and so basically you want to identify some action stuffs and they are usually of who or of process. Jack: Right exactly. So the process is the one that I want to jump in because particularly for the solopreneur right now if you have a team already it is fairly easy that you basically decide who is going to be in charge of it, but typically deciding who the person is not enough because you probably did that already. You probably always, you have a team around you, you probably already asked somebody to be in charge of it yet they are not doing the job that you wanted them to do and if that is the case, it is our experience that it is mostly not that they don’t want to do the job properly, mostly it is that they don’t have enough guidance to do the job properly, they don’t have a process laid out that they need to follow. They don’t have authorization levels that they know that within a certain limit of dollars or leeway that they have a certain fixed leeway that up to a certain amount of units, up to a certain amount of volume, up to a certain amount of dollars. Michelle: They are empowered basically. Jack: …They empowered to make a decision but not only that but that they then still report their decision back to you on a daily or weekly basis so you are informed about what decisions are made and you can actually steer that person from those decisions and make sure that that if they made a mistake at least they only made a mistake on a small item, you can correct that and over time you can give a more and more and more leeway meaning that they can decide more and more on their own without having to bother you all the time, without having to come or ask you and without having to involve you, nothing bothering. But over time it becomes sometimes a bother because you get mad at them because you are like, “Man, I told you how to do this, why are you not doing it?” Well, usually it is not that you told them. It is not enough to tell them. It needs to be done such that you tell them what needs to be happened, what happens in which exception case, what limits of authorization they can have and then let them run with it, let them report back to you and so on and so forth. So there are some simple ways that you can work with that but the very first step is to identify one or two things that you need to do, is it that there is no person in charge whatsoever, now you got to find somebody perhaps that is an outsourcing opportunity. Michelle: And it could be an area where you know you will move the needle the most and make a tremendous windfall either in terms of leads or either in terms of you know freedom of time because you won’t be doing this, you know and you won’t be as involved in it, won’t be absorbing 80% of your time, etc., it could be. Jack: Right, so filling out this little form and doing this little exercise really doesn’t take more than five minutes. Michelle: It is a thinking tool, yeah. Jack: It is a thinking tool, right. It is a five-minute exercise that you realize that you organize your thoughts and realize why you are so stressed out, where you are spending your time, on which parts of your business are bombing you down on a daily basis and weekly basis and number 2 where you want your involvement to be in that business and number 3 develop a couple of action steps that you can take to make sure that these things are taken care of. So for the number 1 and that perhaps to wrap it up, the number 1 action step that we discovered that was that our team did not have enough authority given by us to actually decide for themselves so no wonder they would come to us all the time. They had the process laid out but the process would not account for all the eventualities which really no process in the world really can so, therefore, every time they came across something that would not fit the exact standard operating process, they would come to us and ask and after a while it drove me crazy, so Michelle who is the more structured of the two of us and the more organized of the two of us, basically developed together with me, I want to take a little credit of it, but you get the majority and developed basically a simple tool that we say now that every time something as we being asked the same question or the same issue arises more than like a couple of times, we basically sit down, we select what’s the issue, how did it come up and how can we push it down the structure of our team closest to the first line of the fence so that they can make those decisions and then at the same time how do we still get the report, how do we still know what the decision was on a regular basis. Right so for example, we have refunds, it’s quality control, we have refunds happening, where we used to be asked for every single refund should we grant it or should we not grant it and you know what my answer was always what if it is within 30 days, yes, no questions asked so therefore I gave them the authority to do that. The next thing came in; some people came after 32 days, should they still get the refund. Now this moment you can play hard ball and say sorry it is after 30 days but in today’s world everyone is a media company and everyone can go out there and start bashing you for just without any reason just because they are mad, because they missed the deadline. So I made consistently the decision to always say, I end it up always saying yes to that too, so after a while I made a new rule, passed it down to my team and said passed it over to my team and said, “You know what? From now on, if it is within a leeway of x days. You can still decide, you can look at their record, you can look at their history, if they are returning multiple products and so on, perhaps at some point in time to say no more or if it’s the first time and it’s a good customer then of course say yes. So basically give them the leeway up to a certain dollar amount and literally that entire issue went away and I am not being asked to step in those items other than for high ticket items where I want to take charge of it anyway. So in that example you just, and if you look at a lot of your areas of your business you can find many areas where you probably involved in similar ways where the answers always the same, and that is just one simple way that you can ease out, I guarantee you at least 10% of your time that you are spending right now if not more than probably. Michelle: Absolutely, I was going to say you can probably free up anywhere from 5 to 10 hours a week just. Jack: Right, you get 5 to 10 hours a week. Well, that is about 12 to 22% of your week by just not having to deal with these kinds of things. So just take the 5-minute freedom plan, our implementation of it takes a little longer, but it will make the difference in your life. Michelle: And I think that is what we have for you all today and I hope that this helps you, you know, with creating a stop-doing list of the things that you basically should definitely outsource, have help with that are not part of your genius own and that do not energize you and do not give you the growth that you are looking to get in 2016. Jack: Exactly and the pieces that you do decide to do even those focus on put in some rules and some leeway for the people around you. Right, so with that, thank you very much. Again ForeverCash.com/Podcast is where you find all the notes and all the links and all the things we mentioned. Jack: Please rate us and again if you want to hear more about the ultimate boardroom then just head over to UltimateBoardRoom.com to check it out. Thank you very much, bye, bye.